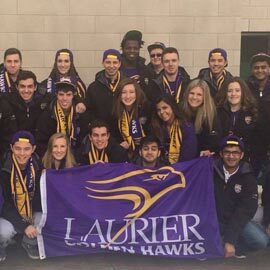 WATERLOO – Laurier’s Lazaridis School of Business & Economics has once again come out on top at JDC Central competition, winning the highest distinction — School of the Year — for an unprecedented seventh year in a row. Hosted Jan. 8-10 by the Canadian Association of Business Students (CABS), over 700 undergraduate business students from 14 universities competed in parliamentary-style debates, academic cases in eight subject areas, charity events, sports tournaments and social activities. Students spend countless hours over many months preparing, putting what they learn in the classroom into practice and making valuable connections to benefit their futures. The Lazaridis School’s 43-member student team was led by co-captains Michael Blair and Connor Shkimba. The team was coached by 10 alumni, last year’s captains, and several professors, including Associate Professor Sofy Carayannopoulos, who served as faculty advisor. In the seven years since JDC Central began, the Lazaridis School has remained undefeated.